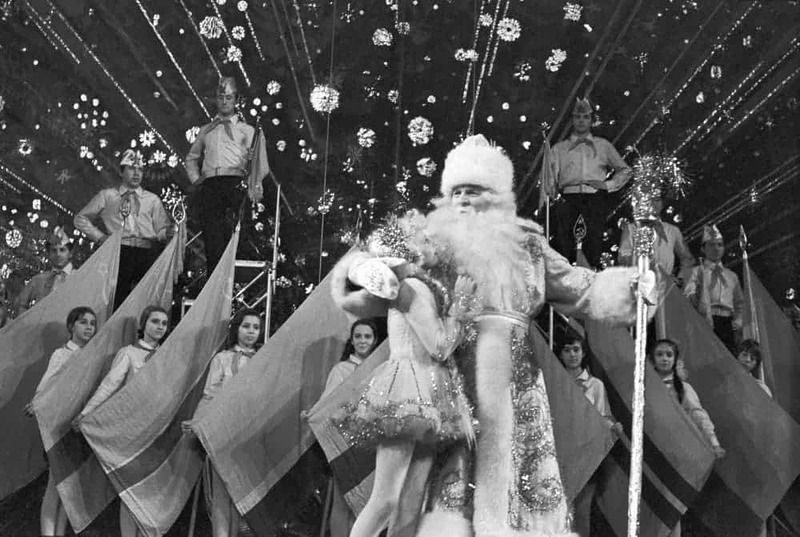 The glorious Ded Moroz during a celebration in Moscow, 1973. Credit: Russian Ambience. The modern mythical figure of Santa Claus has gone a long way since Saint Nicholas, the fourth-century Greek bishop and gift-giver of Myra which served as folklore inspiration. Today, Santa Claus conjures the image of a jovial, red-nosed, round-bellied, red-suited, bearded figure, but this doesn’t apply to all of the world. Russia and many other Slavic countries, particularly in Eastern Europe, have their own version of Santa Claus called Ded Moroz. Ded Moroz is very similar in many respects to Santa Claus, but can be strikingly different. For instance, Ded Moroz carries a staff and wears a long white beard. His coat is sometimes red, but most often is blue. He wears tall valenki, traditional felted boots from Russia, to protect him from the cold. Instead of eight reindeer, Ded Moroz employs three horses that drive his Russian troika. 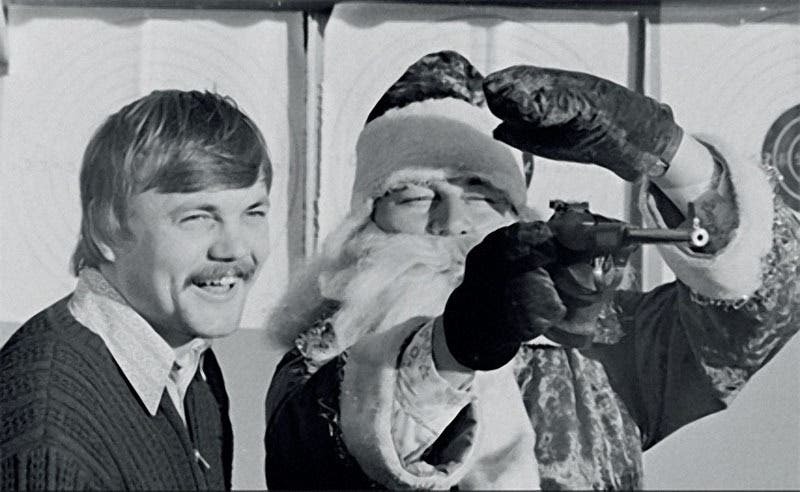 Gifts are delivered on New Year’s Ever rather than on Christmas Eve, a remnant of the Soviet transition to more secular holidays. Instead of the North Pole, the Russian Santa Claus officially makes his home at an estate in the Russian town of Veliky Ustyug. 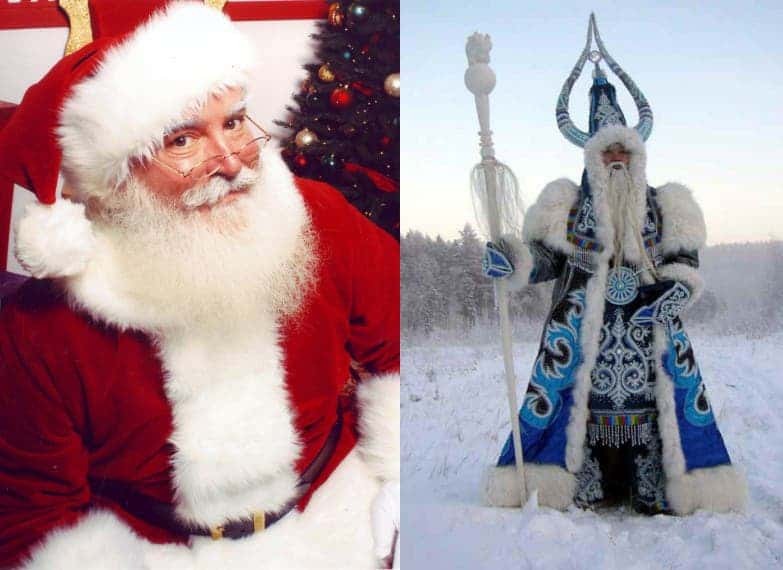 Santa Claus vs Ded Moroz. Say what you will about Moroz, but he has style! Like the western gift-bearer, the Slavic Santa went through many transformations. The origin of Ded Moroz, sometimes known as “Grandfather Frost” or “Father Frost”, can be traced to Slavic mythology which predates Christianity. According to these myths, Frost or Morozko was known as a snow demon for some, and “a powerful hero and smith who chains water with his “iron” frosts,” to others. Morozko could be quite cruel as popular folklore suggests he would kidnap children, and only return them when their parents provided him with gifts. Under the influence of the Orthodox Church and Russian authors, Ded Moroz morphed into a kinder magical figure who instead of kidnapping children, provides them with presents on New Year’s Eve. 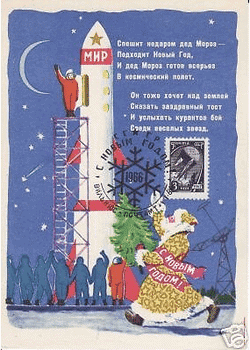 1963 Soviet postcard showing Ded Moroz supporting the Russian space program. Credit: Ebay. In 1917, following the Bolshevik Revolution, Ded Moroz was outright banned because he was considered a sort of children’s god and too “bourgeois”. That sounds a lot like religion and in the newly founded Soviet Union there was no place for it. Ded Moroz would be reinstated by Josef Stalin who was looking to build support twenty years later. The new government, however, framed Ded Moroz as a gift bearer that comes only on New Year’s Eve, as celebrating Christmas was not allowed in the Soviet Union and Soviet Bloc countries. His coat was also made blue so as not to be confused with the red-coated, Coca-Cola drinking, capitalist pig Santa Claus. And, of course, Ded Moroz is slender and manlier than Santa. The Soviet Ded Moroz doesn’t only know when you’re naughty — he knows everything. He taps your phone and invades your living room with propaganda. He swiftly delivers a wooden toy if you’ve been a hard-working child but can be mean if you missed your factory quota. He comes and leaves through the front door because he already has the keys, silly. No need for a chimney entrance. If you lived in a Soviet satellite country, you had your own version of Ded Moroz to remind you that we all belong to one big, working family who lives to serve the state and party. The home of Ded Moroz is found in Veliky Ustyug, Vologda Region, Russia, and is often visited by children and friends of Father Frost. Ded Moroz is said to bring presents to children starting November, but he’s the most giving on New Year’s Eve. Traditionally, this is the night Ded Moroz and his companion Snegurochka put presents under the fir tree (New Year’s Tree) for children to discover in the morning. Despite decades of rule, the Soviets failed to make their fabricated version of Ded Moroz stick with the population. After the Soviet Union Collapsed in the early 1990s, people returned to their old customs, like celebrating Christmas. People from former Soviet Bloc countries actually started demonizing their Ded Moroz clones like Dyado Koleda in Bulgaria, Djed Mraz in Yugoslavia, Dziadek Mróz in Poland or Moş Gerilă in Romania, since they saw him as a specter of times they did not want to remember or celebrate. Today, Ded Moroz is mostly celebrated in Russia, having gone out of fashion in other countries.